Just across the Veteran's Memorial Bridge near the Inner Harbor lies one of Baltimore's most pleasant outdoor parks. Baltimore’s “other waterfront”— Middle Branch Park- on the “middle branch” of the Patapsco River. In 1926, Baltimore City assumed ownership of the waterside property. Originally open water, the property was extended southward into the Patapsco River when the property was filled between 1977 and 1986 under the supervision of the U.S. Army Corps of Engineers. 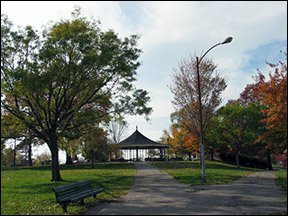 With a hard-working history, the 150-acre Middle Branch Park was created by Baltimore City in 1977 by consolidating existing shore side parks- at which time the city began restoring environmentally degraded sites. Ten years later, the Baltimore Rowing and Water Resources Center opened, reviving a tradition of rowing competitions. Middle Branch Park offers a clear view of the Baltimore City skyline, as well as a wildlife observatory area and a boardwalk. From the park, you can try sculling with the Baltimore Rowing Club, participate in the Baltimore City Recreation and Parks Canoe and Kayak programs, take a paddle in your own craft, or test your luck with recreational fishing or crabbing. You can hop on the Gwynns Falls Trail- biking or walking 14 miles west toward Gwynns Falls Leakin Park or 1 mile north to the city’s Inner Harbor. FUN FACT: Now the largest expanse of natural shoreline in the Baltimore Harbor, Middle Branch Park was once an auto junkyard. In Proximity to. . .